The Humboldt County Office of Emergency Services reports that 8,000 customers are without power across the region as of 11 a.m.
State Route 36 is closed at Alderpoint Road in Bridgeville due to downed trees. Chains required between Bridgeville and Dinsmore. 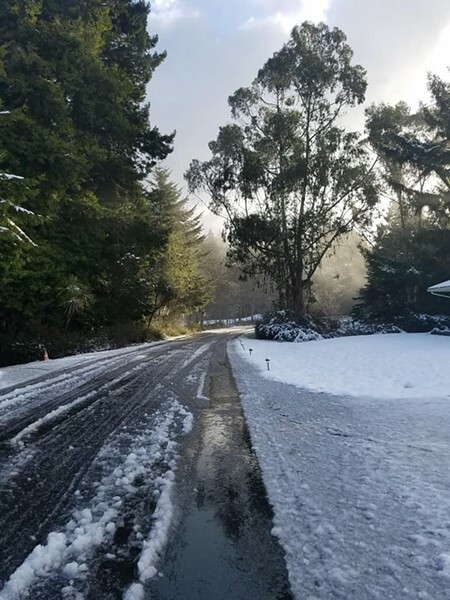 U.S. Highway 101 is now open to one-way controlled traffic in northern Mendocino County, after a full closure for snow and rock slides. State Route 299 is closed 3.3 miles east of Humboldt County line in Trinity County due to downed trees. In Humboldt, chains are required from ~12 miles west of State Route 96. Check out preliminary snow fall levels via the Eureka office of the National Weather Service here. 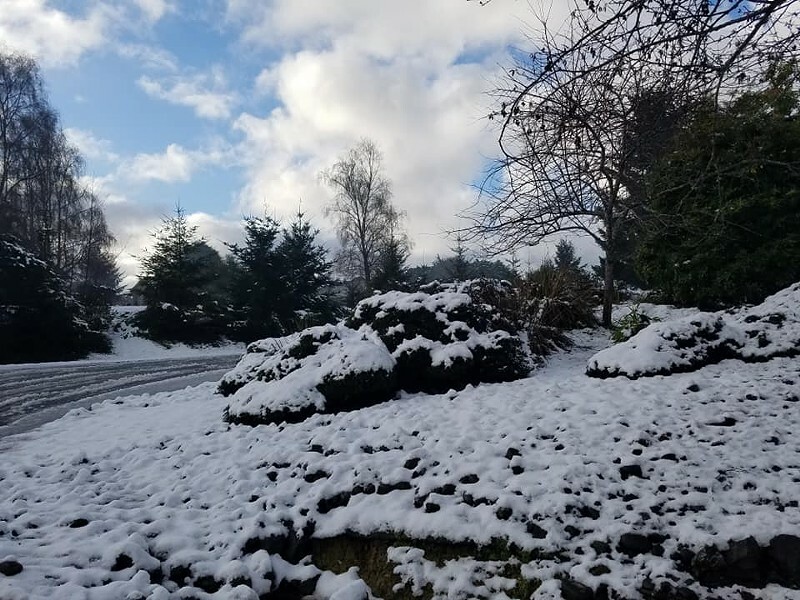 In case you missed it, or in some cases simply haven't looked outside yet this morning, Humboldt County got a healthy dollop of snow last night and early this morning, from the peaks down to the shores. 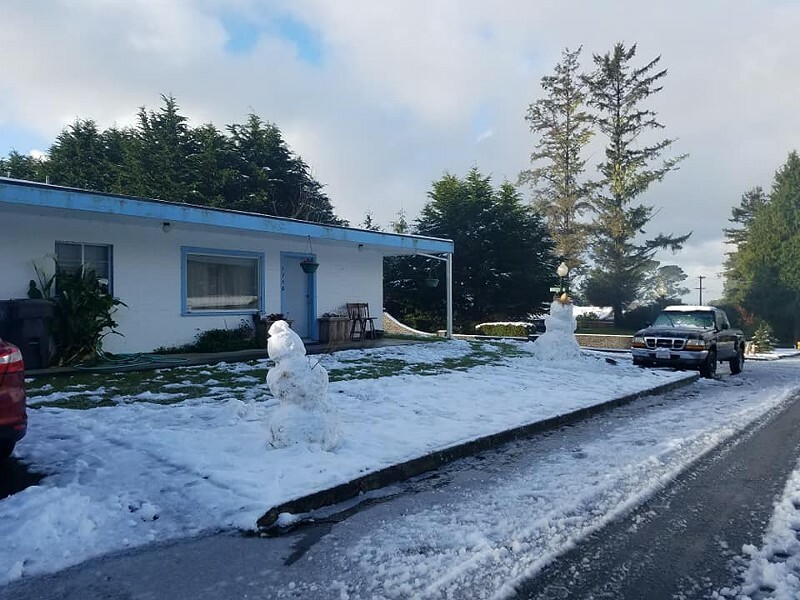 Anecdotal reports have snow falling throughout the county, with accumulations of more than an inch — and up to 4 — in areas from Eureka to the Arcata Bottoms and up to McKinleyville and Westhaven. 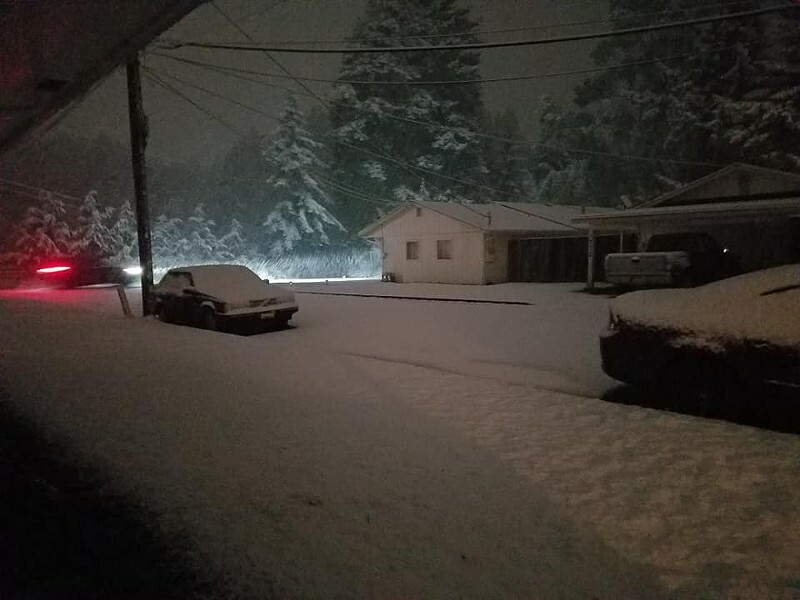 The snowfall, which began around 10 p.m. last night and continued almost until daybreak in some areas, has tapered off, with partly cloudy conditions expected to persist throughout the day until a chance of rain showers takes over tonight, according to the National Weather Service website. The Weather Service is advising folks to monitor local road conditions closely today, to carry chains if traveling inland and to drive with extreme caution, if they must leave the house at all. According to the California Highway Patrol incident page, there are a host of hazards throughout the county, from downed trees to icy conditions. Motorists are advised to use extreme caution and, again, stay home if possible. Caltrans reports that U.S. Highway 101 is subject to one-way controlled traffic at various locations between Leggett and Garberville due to rockslides. 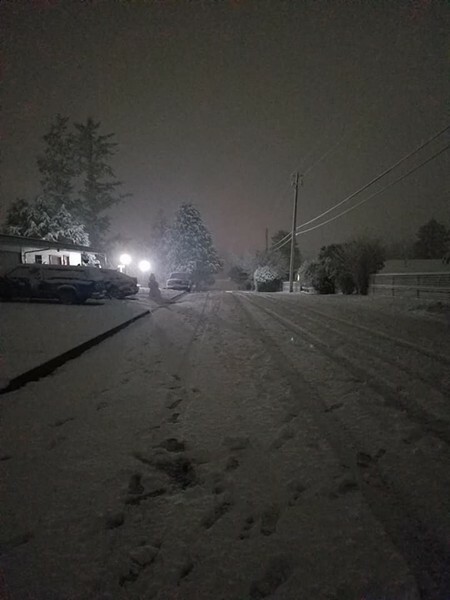 State Route 299, meanwhile, is closed about 3 miles east of the Humboldt-Trinity county line due to downed trees, and chains are required 12 miles west of the junction with State Route 96. State Route 36 is closed at Alderpoint Road in Bridgeville due to a downed tree and motorists are advised to find an alternate route, though that may prove a challenge. State Route 199 to our north, meanwhile, is also closed due to downed trees. In short, it's not a good day to be on the roads. It is, however, a good day to build snow people, dust of the sled and have a snowball fight or two. 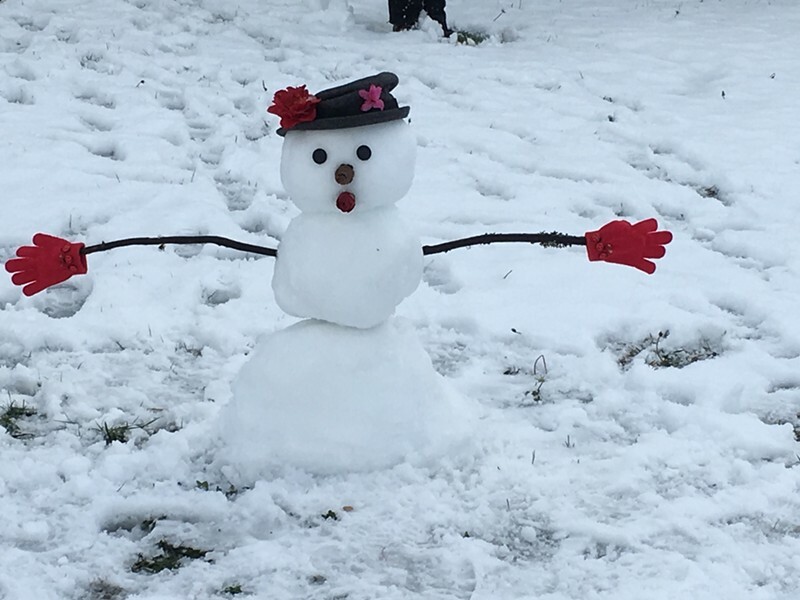 And please send us pictures of your fun to editor@northcoastjournal.com! 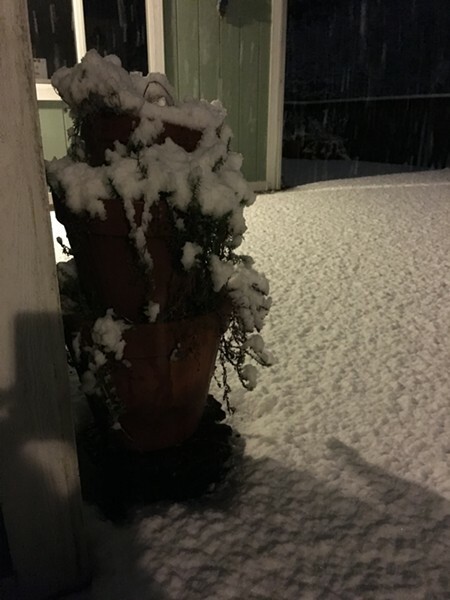 McKinleyville with a fresh blanket of powdery snow around midnight Feb. 9. 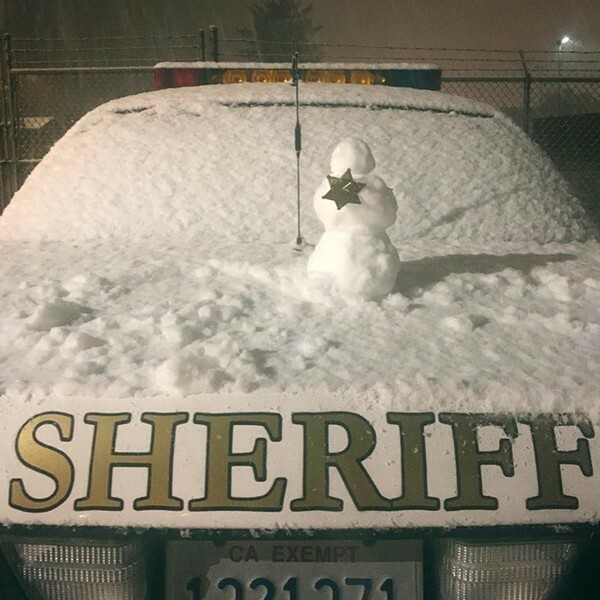 Deputies at the McKinleyville substation got in the spirit.